Erupting volcanos are not usually a consideration when planning holidays .. make sure you have options! 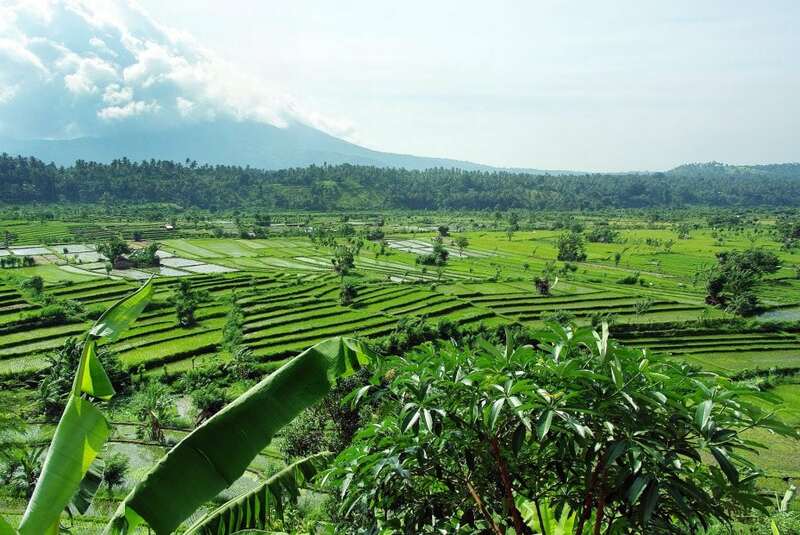 Ever thought of what you’d do if holidaying in Bali when a volcano erupts? Do you have a plan B? Have you ever considered your options if a natural disaster occurs whilst traveling overseas? Bali is one of Australia’s favourite holiday destinations. Most of us have opted for a Balinese holiday at some point as it’s so easy to fly in and out from practically every city in Australia. Balinese people consider Australian’s as one of their most valued tourism markets and appreciate the continued visits of Aussie tourists each year. It’s when natural disasters occur, that Bali is impacted the most. Indonesia has been on and off alert since mid August 2017 when volcanic earthquakes in the East Bali region commenced. Mt Agung began erupting while we were visiting Bali in August last year and since then, layers of fine volcanic ash have been settling on houses and fields as the volcano continues to spew thick smoke clouds over the beautiful island of Bali. The massive plumes of ash from the Mount Agung volcano have reached estimated heights of seven miles above its rumbling crater. High winds caused by passing by cyclones in the Indian Ocean, have further dispersed ash from the volcano. An eerie and abandoned appearance is being cast on nearby towns and villages. The Balinese government has prepared for this emergency well and has made substantial plans to mitigate chaos and disruption. In August, over 100,000 people from the Mt Agung region were evacuated to shelters and thousands of tourists were stranded in Bali due to the closure of Denpasar airport. Including us! Not all locals left their homes. Some have insisted on waiting until lava from the crater makes it’s way down the mountain with many continuing their day to day activities. Sadly, many Balinese will lose everything they have, their homes, their livestock and all possessions. Many have lived through the prior eruptions of Mt Agung in 1963, where an estimated 1,600 people paid the ultimate price with their lives. During this crisis, the Minister for Tourism made a recommendation that additional accommodation costs for displaced or stranded holiday-makers in Bali were to be offered to travelers at a 50% discount to help offset these unexpected expenses. People were generously supporting others and there was a general ‘feeling’ of care, good will and understanding in the air. When we planned our short holiday to Bali we didn’t expect that Mt Agung would make more than a few noisy grumbles during our stay. Darwin often experiences earth tremors originating from the southern Asia region so for us, a few earth tremors is nothing new. It’s easy to be complacent especially when volcanos are largely unpredictable. As one of the preferred holiday destinations for Australians, it is estimated that over 200,000 Australians are holidaying in Bali at any point in time. With the end of year, many of our school leavers chose to holiday so many young school leavers traveled to Bali to celebrate their final studies and were caught up with us – over 90,000+ backlog of travelers who were stranded in Bali. Hundreds of flights were cancelled after the Denpasar airport was closed after a series of major eruptions amid fears the giant ash cloud from the volcano could further disrupt navigation for flights to or from Bali. It was only when the announcement of Denpasar Airport’s closure, that we began to consider that we may need alternate exit options. Most of us take travel insurance, as part of our travel costs and this erupting volcano is a perfect example of why you should never leave home without travel insurance. Our return flights to Australia were booked, but given that all flights in and out of Bali ceased it was time to consider our options. Confirmation of our flights home were not received from the airlines. We were given no surety of when we would be flying home. Speaking to other stranded travelers I noted that communication from the airlines (all of them) had been limited and most of us stayed close to the hotels to enable WIFI access to emails. We caught up with friends from Darwin who were also stranded in Bali and sought to coordinate a joint exit plan so that together, we would have options. Not knowing our options in a foreign country with little language, limited local knowledge and limited funds is one of the biggest fears we all face when caught unawares. We felt we needed certainty. Our flights were originally scheduled for Thursday night so we drew a line in the sand. If no confirmation was received from the airlines, then we’d enact Plan B and set about making our own way home – via an alternate route. Booking a bus to depart Kuta early on Saturday morning, we planned to make the journey to the city of Surabaya on Java. Surabaya is a 12 hour drive from Kuta in Bali and due to the wind direction, the airport remains clear. Connecting with flights to Singapore from Surabaya we planned to link up with connecting airlines to return us to Darwin, Australia. We booked fully flexible flights, just in case these plans need to be altered again. We also booked accommodation in Surabaya and Singapore with the knowledge that we would most likely lose the costs incurred, should these bookings not go ahead. Our thoughts were that it’s better to have somewhere to sleep … than not! It was somewhat more comforting to know that we had alternate plans if our safety was at risk. Denpasar airport reopened early on Wednesday evening with advice that it may close again at any time due to the ash cloud that was likely to encroach on the fly zone. Our original flights were scheduled for late Thursday night, so with our fingers crossed we hoped that that our flight would leave on schedule. We made no attempt to cancel our Plan B arrangements until we were back on Australian soil. Don’t panic: First, contact your airline. This may only be possible through social media or via chat options on their website due to the mass congestion which bordered on panic. Make sure you quote your booking number so they can review your specific booking and provide information relevant to your booking. From here you can make informed decisions. Are you safe: This needs to be your first priority. Ensure the safety of yourself and those traveling with you. Ensure you are registered on Australia’s ‘Smart Traveller‘ website in case your emergency details are needed. What alternatives are available: If you feel sure that your flights will be disrupted consider other options. Review alternate departure options from a nearby city. Are you able to drive to the next city? What is the likelihood that this airport will be closed as well? And where to from there? Consider staying exactly where you are: Sometimes the best solution is to do nothing and wait patiently for the urgency of the situation to clear being mindful of course, that you and your family are in no immediate danger. With social media it’s easy to keep in touch so be sure to keep in touch with friends and family so they aren’t worrying unnecessarily .. do try to relax and don’t panic.